Using the organisation’s financial results to monitor how communication efforts are aligning to the overall business objectives. It’s great when companies try to improve employee engagement and even better when they measure it. Measurement is the first step companies must take before they can implement meaningful actions to improve engagement. But if they don’t measure the right things in the right way, those actions won’t matter — and they won’t have a measurable impact on business outcomes or the bottom line. Gallup researchers continually study findings to learn more about employee engagement and its impact on organizational and team performance. Research studied the differences in performance between engaged and actively disengaged work units and found that those scoring in the top half on employee engagement nearly doubled their odds of success compared with those in the bottom half. Those at the 99th percentile had four times the success rate of those at the first percentile. These kind of performance differences are always important to businesses. 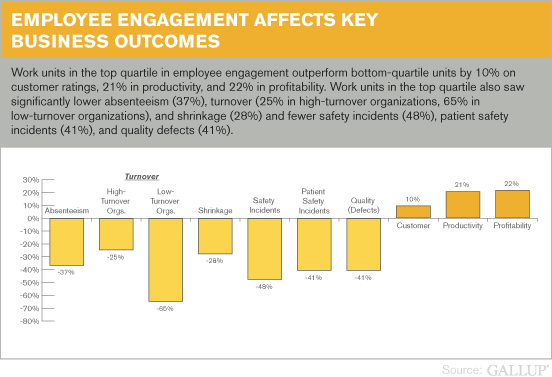 Work units in the top quartile in employee engagement outperformed bottom-quartile units confirming that employee engagement relates to each of the nine performance outcomes studied. Gallup also found that the strong correlations between engagement and performance are highly consistent across different organizations from diverse industries and regions of the world. Researchers discovered that having an engaged workforce became a strong differentiator in EPS. Companies with engaged workforces seemed to have an advantage in regaining and growing EPS at a faster rate than their industry equivalents. Conversely, companies with average engagement levels saw no increased advantage over their competitors in economic instability.